Starting with a 1951 baseball game and ending with the Internet, “Underworld” is not a book for the faint-hearted. Elegiac in tone and described variously as DeLillo’s Magnum Opus and his attempt to write the Great American Novel, the book weighs in at a hefty 827 pages and zips back and forwards in time, moving in and out of the lives of a plethora of different characters. 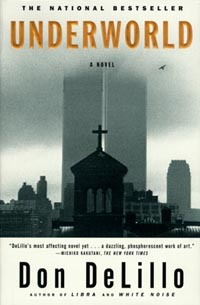 Following three main themes – the fate of a baseball from the winning game of the 1951 world series, the threat of atomic warfare and the mountains of garbage created by modern society – DeLillo moves forwards and backwards through the decades, introducing characters and situations and gradually showing the way their lives are interconnected. Reading the prose can be uncannily like using a web browser: the narrative focus moves from character to character almost as quickly as we are introduced to them, and the time frame regularly changes to show further connections between the key players. This device – literature as hypertext – is particularly effective in the early parts of the novel and the technique never intrudes on the story itself. The book focuses on Nick Shay, a former hoodlum who now works in the burgeoning waste management industry and owns the baseball from the 1951 game, “the shot heard around the world”. In addition to Nick we hear from Frank Sinatra, J. Edgar Hoover, Lenny Bruce and the various people who move in and out of Nick’s life: lovers, family, friends and colleagues. Through these seemingly disconnected narratives DeLillo paints a picture of Cold War paranoia at its peak – the baseball game happened the same day as the USSR’s first nuclear test – and the changes affecting his characters as a microcosm of American society as a whole. Very few writers, however, can justify over 800 densely-printed pages to tell a story and “Underworld” would have benefited greatly from judicious wielding of the blue pencil. Potentially intriguing plots which feature strongly in the earlier parts of the book – an intriguing serial killer subplot, the stories of each person who possesses the winning baseball – are abandoned halfway through the book in favour of overlong childhood memories or the inane ponderings of a performance artist; other stories are neglected for over 400 pages before reappearing at the end of the novel, causing an unwelcome jolt as the reader tries to remember the pertinent details. In this respect “Underworld” is a victim of its own ambition: by trying to cover such a wide range of characters and situations, DeLillo loses track of some of them and, in the latter parts of the novel in particular, the writing feels as if it is on autopilot while the author works out what to do next. There is still much to recommend in “Underworld”, however. Each vignette is lovingly crafted: DeLillo seems as comfortable writing from the perspective of a street missionary as he is inhabiting J Edgar Hoover’s paranoia. The book employs vivid imagery, from painted angels on ghetto walls to the cityscape created by mountains of domestic waste, and the dialogue is usually well-observed and thoroughly believable although it does flag when describing Nick Shay’s hoodlum past. Despite its faults DeLillo has created an ambitious and powerful novel which, due to its size, can also be used to swat annoying children on trains. Highly recommended.